Spanish fashion brand Mango has launched Rebel Hero Night Out, a flanker to 2013's Rebel Hero for Him, and Lady Rebel Night Out, a flanker to 2009's Lady Rebel. Rebel Hero Night Out ~ with rum, lemon, yuzu, cardamom, black pepper, davana, vetiver, cedar and musk. Lady Rebel Night Out ~ with bergamot, tangerine, pear, peach, jasmine, gardenia, magnolia, sandalwood, amber, vanilla and tonka bean. 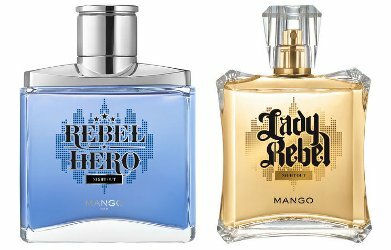 Mango Rebel Hero Night Out and Lady Rebel Night Out can be found now at Sephora in France, in 100 ml Eau de Toilette. Both are limited edition.